Hello everyone! So welcome back to Mari's dream! Yes, you're still inside my dream because if I were to create a lipstick collection, this would be it. You guys know hoooow much I love pink lipsticks that when L'Oréal released their Velvet Pinks collection I just went wild with giddiness. I wear pink lipsticks everyday, save for like the 0.1% of the year when I'm in a red lipstick. But the 99.9% really goes to a pink lipstick or lip balm or lip gloss. I think the feelings of giddiness were intensified by the fact that these lipsticks were sent with super beautiful (and expensive oh my goodness) Ecuadorian roses of Petalier. You may have already seen the press release for L'Oréal's La Vie En Rose Velvet Pinks Collection Star Color Riche Lipstcks collection (whew what a mouthful! ), with the campaign being hashtagged #IChoosePinks because this whole collection is meant to cover all kinds of pinks to make sure that every Pinay has a pink that she can relate to and would be comfortable rocking out. 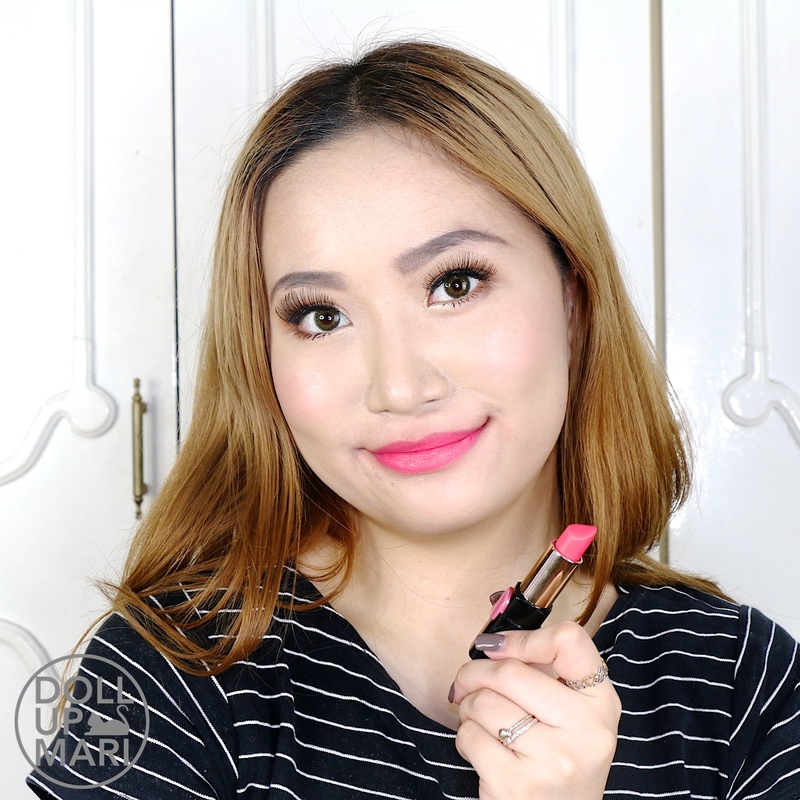 L'Oréal knows that deep inside, every girl wants to wear pink lipsticks, but sometimes the fear of looking childish or the fear of looking weird with pink gets in the way of getting tickled pink. So this post in specific is about Collection Star Blake, or Primrose. So this is how the packaging looks like. Since this came in a pretty box with the six other lipsticks in a fancy manner, this unfortunately came unsealed and therefore I have no ingredients lists for this collection. But well, in exchange for the ingredients list I got Ecuadorian roses for the first time in my life (and they're now potpourri in our living room), so that's fair. 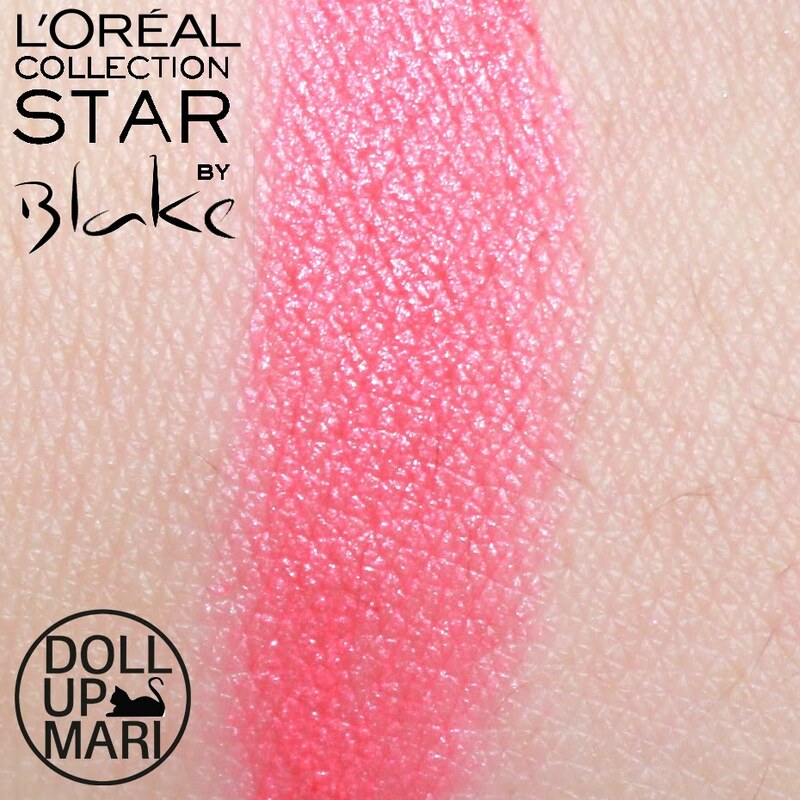 In our territory its other name is Primrose, but I think in other territories even the bottom of the lipstick will say Blake, too. I already own 11 of these lipsticks and I can really say that the packaging is a lifesaver. 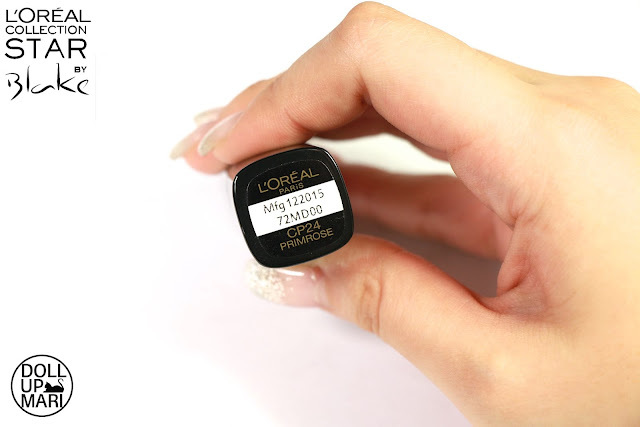 In real life, L'Oréal is very good in making these plastic squares in colors that are very true to the actual lipstick. So even if they're side by side, you can still tell by the plastic tile as to which shade is which. It's relatively easy to look for what you're looking for in a short amount of time. The signature of the celebrity on the packaging also helps so much because when I am rushing to get somewhere, simply knowing which celebrity made which shade is already enough because I just look for what I want based on the signature. For this shade, this is a baby coral pink, but the coral is a tiny tiny touch to the whole ensemble. Upon visual inspection, between this and Aishwarya, you'd need to look a little bit closer to tell the two apart. But when you see the swatch already, you'd see that this is warmer and a tiny little bit darker compared to Aishwarya. However, the two of them have neon touches (although not as crazy of a neon as Doutzen), so if you're choosing between Blake and Aishwarya if ever, there'd just be a very fine line between them. This is how it looks like on the lips. So this, and all the other shades in the Color Riche collection, have the ability to be so buildable. You can use this as thinly as tint, or you can pile it on as thickly as you want to make it emulate the effect of a liquid lipstick. For this photo, I have it put on relatively thickly for it to be opaque enough, but not too thickly for it to behave as liquid lipstick altogether. In real life, (since you guys technically will not look at my lips like this), this goes on quite matte-ly. Since this lipstick is a baby pink, it doesn't have as profound of an ability as a red lipstick to be able to create an illustion of whiter teeth. 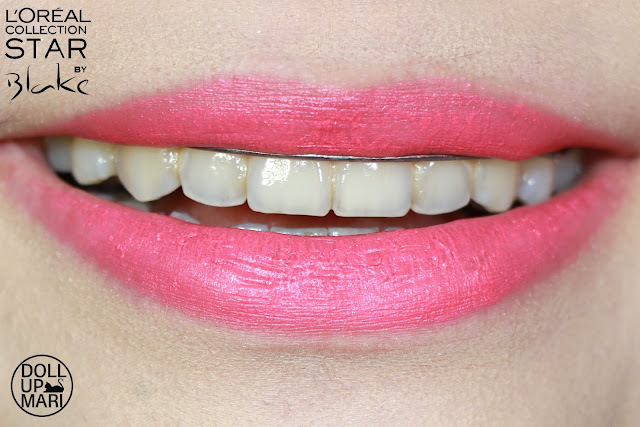 Of course it won't make your teeth look more yellow, but since it's more mellow, it "blends" in to the situation instead of being the focal point of your whole look. So this is how it looks like on me overall. Just like Aishwarya, this is a mellow baby pink. But I think the difference comes in real life when I wear this vs. Aishwarya in the sense that this "appears" or "stands out" a little bit more. I think this is a warmer shade compared to Aishwarya, so when it's placed against my cool pinkish skintone, it stands out instead of blending in. But since this is still a baby pink, it's not an awkward kind of standing out. So I think if you choose between this and Aishwarya, the choice will depend on the undertones of your skin and if you want the lipstick to blend in or to stand out. I also think that this will really contrast in a good way on darker skintones, so that can also be a factor in your decision. 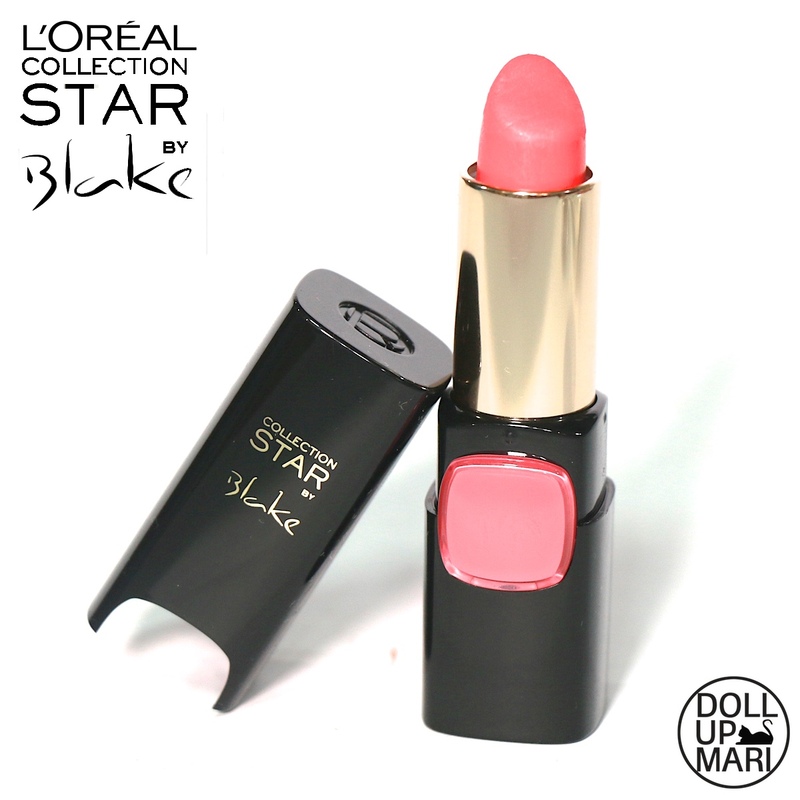 This is a veeery lively shade (just like the celeb it's associated with!) so I think this will be very good for those days when you really need your makeup to make you look like you're alive and you've had sleep. 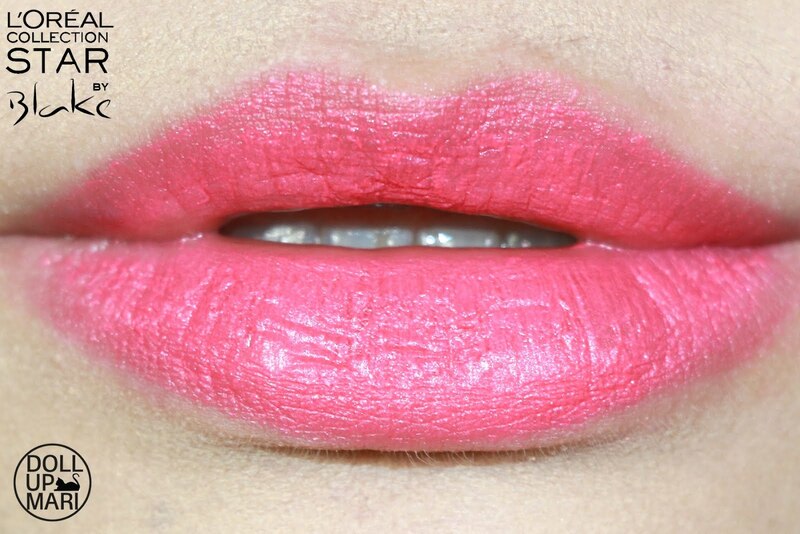 If you are into coral but are more into the pinks (like you just like a coral touch and do not want a wholly coral lippie), this one is for you. According to Verna Marin, chief makeup artist of L'Oréal Paris Philippines, this will work best on light skintones. According to Marilene Perez, writer of this blog, you need this and all the other shades in the collection because every shade is too pretty to not buy. Color Payoff- This collection ALWAYS has the best color payoff. Lipsticks are always as vivid on me as how vivid they are on the tube, and the color is more or less accurate relative to the tube. I've also enjoyed how vivid the colors are that most, if not all, of my lipsticks from this collection leave very good stains and tints. Texture- These lipsticks have a silky texture, and presumably have a powdered formula in order to make them matte and silky. So like when you use these, they're not as slippery as using lip balm, but they do not resemble the formulae of liquid lipsticks or matte creams as they are much more emollient and spreadable. These later generation ones are less wispy than the old L'Oréal lipsticks, but the structure in the formula is perhaps what helps to make it buildable. You can pat this on and the color will be able to stick on and look like a tint. You can add more, apply it more liberally, or go back and forth several times in order to get a much more opaque look. Comfort- These lipsticks are less wispy and less spreadable (spread as in how slippery it is when you smack your lips, not to be confused with blendability) than the old generation ones, so they feel less like lip balms now. 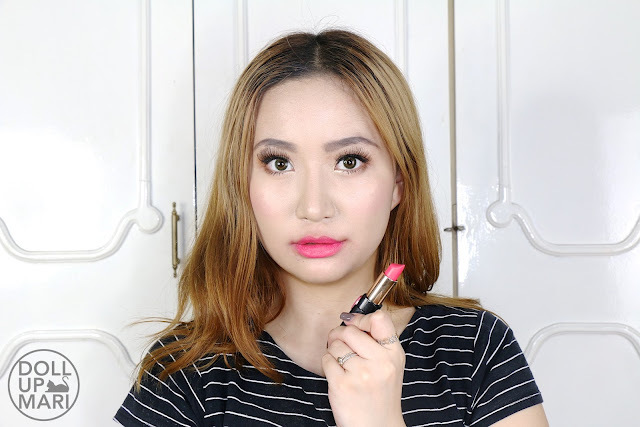 However, compared to matte lipsticks of other brands, or the high vivacity color formulae of other brands, this is more spreadable and more comfortable. 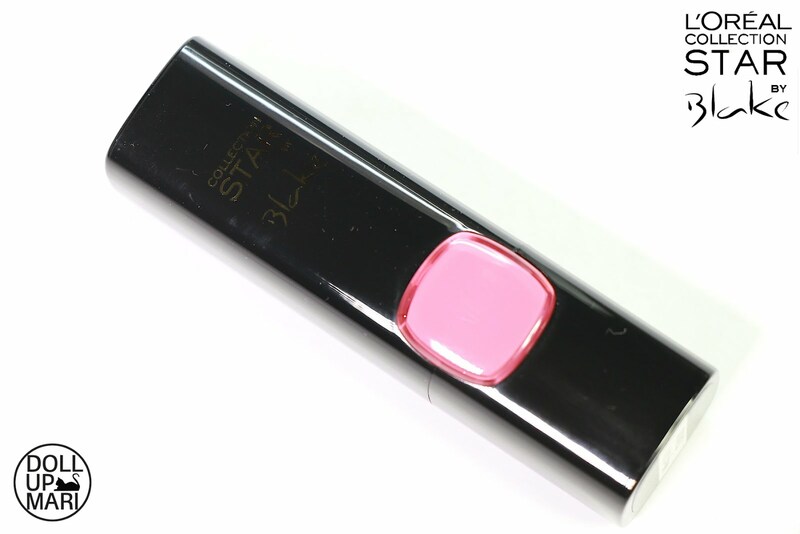 One key feature of this is that it does not weigh the lips down by having an opaque formula, so it doesn't feel heavy on the lips, which helps to make things more comfy.